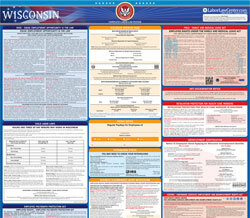 The Employee Rights Under Wisconsin's Business Closing/Mass Layoff Law is a general labor law poster poster by the Wisconsin Department Of Workforce Development. This poster is mandatory for some employers, including employers with 50 or more employees. This poster must be posted in a conspicuous place by all employers that employ at least 50 employees so that all employees can see it. This poster describes what a mass layoff is, who must provide advance notice of a mass layoff, whether or not employees are entitled to receive notice or not, and what employees can do if notice is not given of a mass layoff and just happens. It appears you don't have a PDF plugin for this browser. Please see the link below to download wisconsin-erd-9006-p.pdf. obligations to give proper	 notice to their employees and others before taking certain actions. including “new” or “low	-hour” employees). 2. At least 500 employees. hours of work per week 	- are 	not	 counted. Who must provide notice and when? temporary cessation in operations, or businesses in financial trouble. What employees are entitled to receive notice? What can employees recover if notice is required and not given? employee may also recov	er attorney fees and costs in a lawsuit.